INEC, Abuja: The Senator Ken Nnamani led 24-man Constitution and Electoral Reform Committee, set up to review the laws governing the electoral process and make recommendations for reforms, yesterday, submitted its report to the Attorney General of the Federation (AGF) and Minister of Justice, Abubakar Malami, SAN. 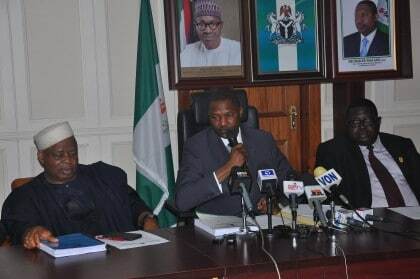 The AGF assured that the Executive would expedite action on the recommendations and urged stakeholders to support the Federal Government by engaging the National Assembly on the speedy passage of the draft bills when transmitted. Chairman of the Committee, Senator Ken Nnamani had earlier said that the Committee swung into action soon after its inauguration on the 4th of October, 2016. He hailed the dedication and commitment of its member who he said was exceptional, professional and patriotic in executing the national assignment. Senator Nnamani explained that the Committee was guided by its 13 terms of reference and painstakingly carried out its job by engaging and interacting with stakeholders across the length and breadth of the country. The report of the Committee according to Senator Nnamani was in two volumes, “the first volume is the main report containing recommendations on how to improve the electoral process in Nigeria attached to it are four draft bills on the amendment of relevant provisions of the constitution, amendment of the Electoral Act, establishment of Political Parties and Electoral Offences Commission and the establishment of Constituency Delimitation Centre. Senator Nnamani noted that the recommendations of the Committee will become the executive bill that will go to National Assembly before it will be harmonized alongside that of the Senate and House of Representatives.